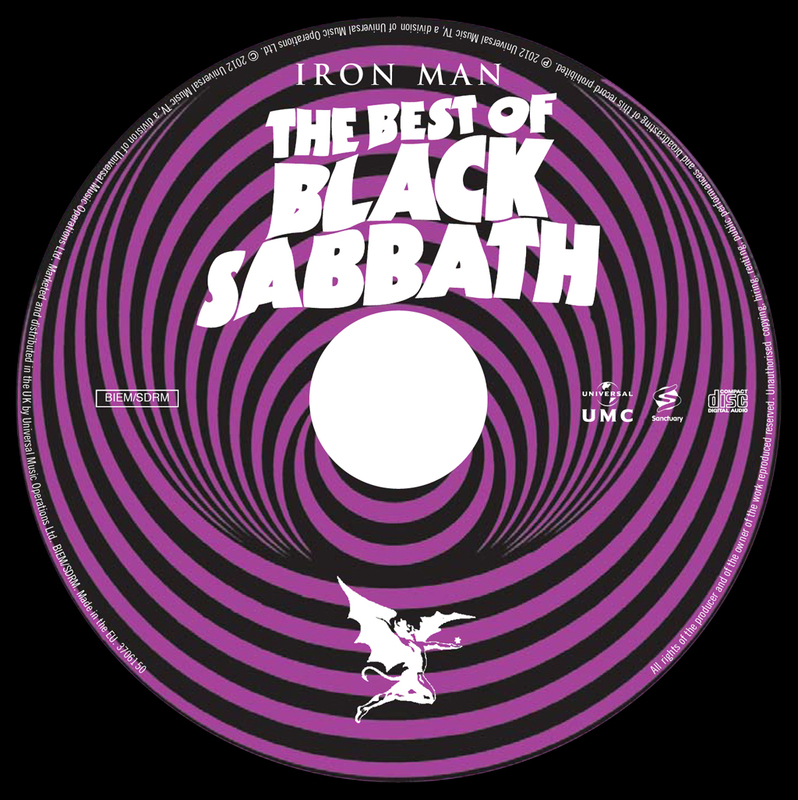 Official Title is: “Iron Man: The Best of Black Sabbath”. This release was handled by Universal Records in UK/Europe. 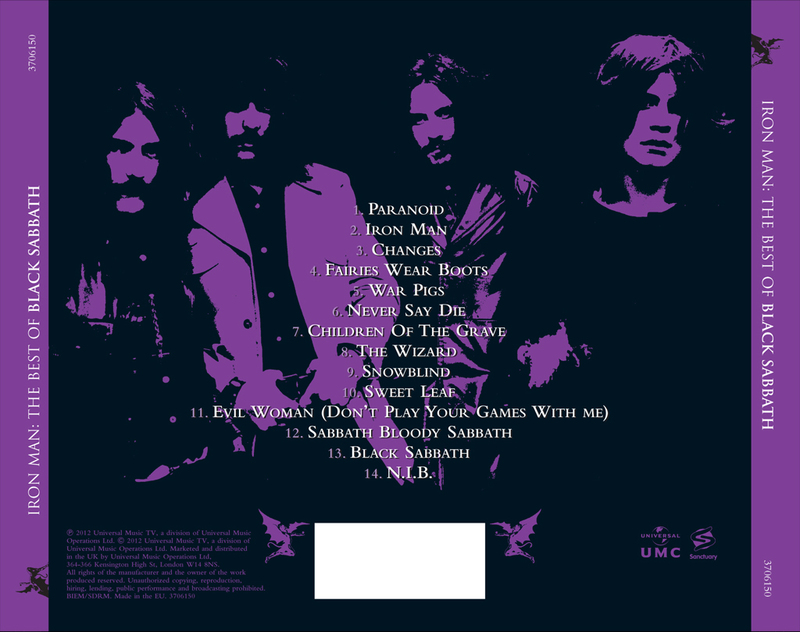 As such, it was not released in the US/North America due to Warner Bros/Rhino having release rights for Black Sabbath there. 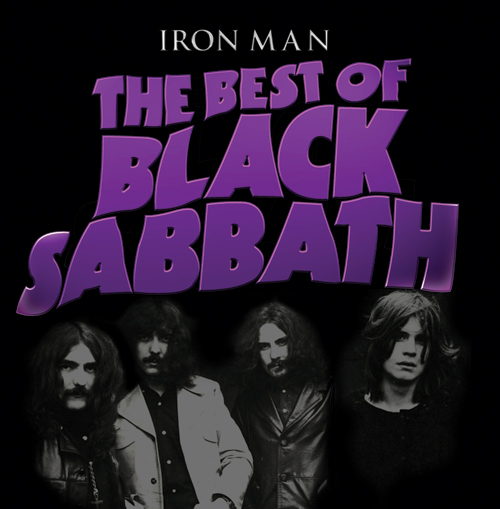 This covers only the Ozzy era from the 70’s. However, the Sabotage & Technical Ecstasy albums are not represented in the track listing, despite both of them being in the under disc tray art. The remastering work was culled from the sessions that produced the remaster work for the Universal Deluxe Edition series from 2009. NOTE: The “2012” in the page URL is my own nomenclature. That is not part of the official name, I did that to differentiate this release from the 2006 & 2009 “Greatest Hits” releases. 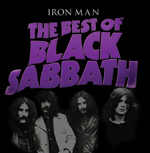 This release replaced the 2009 Greatest Hits album in the Universal catalogue. When this was released, the previous 2009 edition was discontinued. Below are the front and back images of the cover art, as well as what the physical CD itself looks like (it has the Paranoid era motif to it). Below is the original press release from Universal for this compilation. Hi Can you get this on vinyl too or just cd. After the 11-11-11 announcement, I was skeptical. Bill had dropped out and I was hearing that it was gonna get cancelled. But this greatest hits came out and the new album got pushed back. I’m sick of all these greatest hits albums. Just have one greatest hits!!!! Not 15 of ’em!!! !